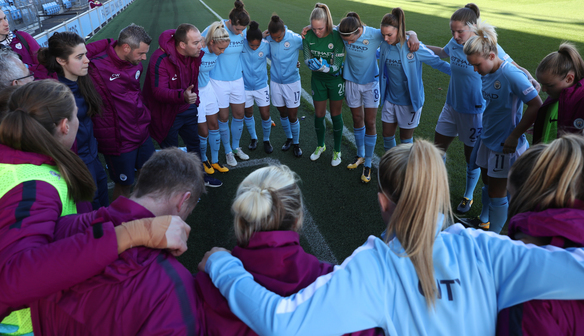 Claire Emslie inspired Manchester City to a 12th successive win in all competitions after an assured victory over Birmingham City in the FA WSL Continental Tyres Cup. The 23-year-old joined Nikita Parris on the scoresheet as City’s unbeaten season continued, also heading top of Group Two North with a quarter-final place now secured for the holders. Though comfortable, the home side didn’t look dominant until the final stages of the game, but kept Birmingham from creating good chances throughout. This was despite the away side often catching Manchester City out in their own half with an intelligent press which Birmingham failed to convert into anything substantial in a repeat of last year’s final. The hosts opened the scoring after 18 minutes, Jane Ross providing a perfectly judged through-ball for Parris to run onto and finish past Hannah Hampton. Emslie doubled the scoring ten minutes from the break, as a tantalising Esme Morgan cross flashed beyond Parris and Izzy Christiansen in the centre before the left-winger finished at the far post. Chances remained at a stretch for Birmingham and, after a relatively tame start, Manchester City clicked into gear more consistently, Emslie making life tricky for Meaghan Sargeant on the left flank. The second half continued in the same way, with Birmingham struggling to create solid attacks while occasionally catching the hosts out in their own half. City had two decent chances with 20 minutes to go, Jill Scott and Ross both narrowly missing the target. Birmingham did get the ball in the net from a corner with five minutes left, but it was disallowed for a foul on goalkeeper Karen Bardsley, with their Continental Tyres Cup campaign going no further this year. “It’s difficult for us in a week where you’ve got Chelsea at the end of it, you could rest players, but the fact that we want to keep winning and we want to keep up momentum means. “It’s hard to try and rest big players because we want to go on and win. “We treated this game exactly like a normal game, as if it were a game we wanted to win and had to win and played a strong team as we could play. “It was a really poor first half, we work on things in the week to get them right and trust me we do a lot of work in the week and when you don’t see it first half it’s very disappointing. “In the second half, you could say Man City were coasting by that point, it just allowed us to play a little bit more like how we want to play. “We can score goals and we’ve not done that the last couple of games. We created half chances at the end but we’ve got to die to get them in the back of the net.